All food has a warterfootprint. We (Americans) throw away between a quarter to a half of the food we grow with scarce water resources. 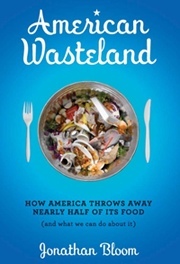 Jonathan Bloom details why we waste so much food and provides ideas on how to stop the waste. Jonathan’s blog WastedFood.com is worth following. You can read my ideas on how to reduce waste at a past blog, Food Waste and Water. thanks for sharing this book title.